We’ve made creating invoices and quotes / estimates as simple as possible yet as full featured and flexible as it can be. *Expired accounts are revived for 10 days so that you can try this out! By clicking the existing “Quoted / Invoiced” checkboxes attached to every project item, you will be able to call up either the quote or invoice creation panel, depending on what you clicked. 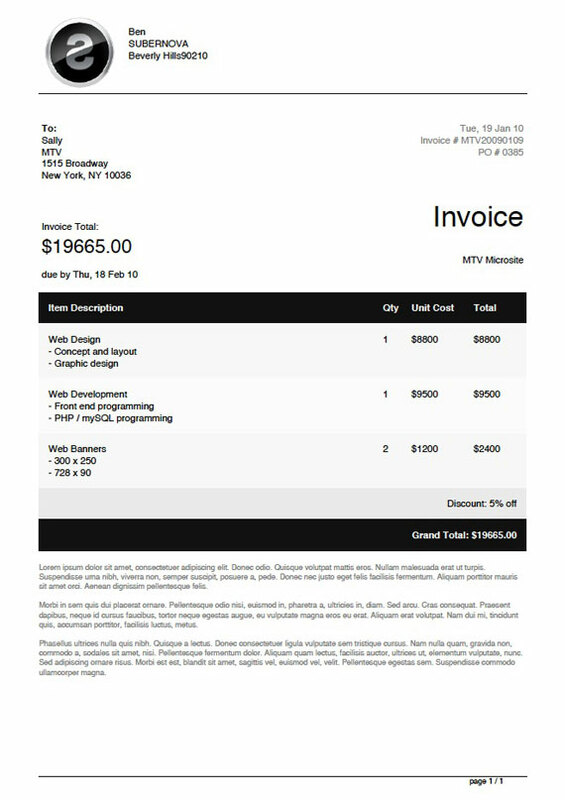 The quote and invoice creation panel looks similar to each other. For instance, if you clicked on the “Invoiced” checkbox, the screenshot below is what you will see. You can set everything from invoice number, discounts to currency. 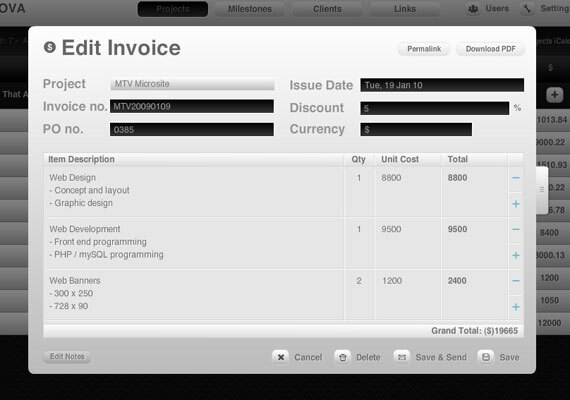 You can also edit notes (pulled in from your settings) for each individual invoice. Once you save the invoice, clicking the “Invoice” checkbox again will show you the same panel, but this time you’ll be presented with the “Permalink” and “Download PDF” buttons. 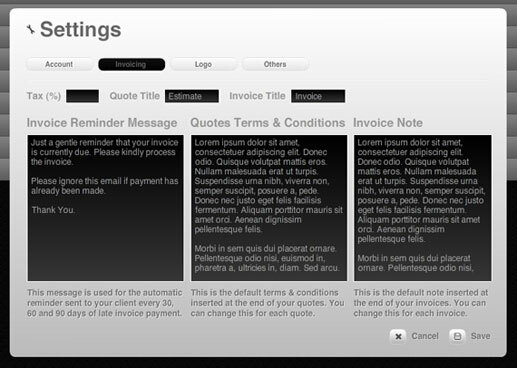 Similarly for quotes, you can edit the terms & conditions and currency for individual quotes. Not every client is the same so we provide this flexibility where you can set different terms & conditions or currency per quote. The online version looks almost exactly like the PDF, but with some added functionalities. You’ll get notified when your client views the estimate or invoice. 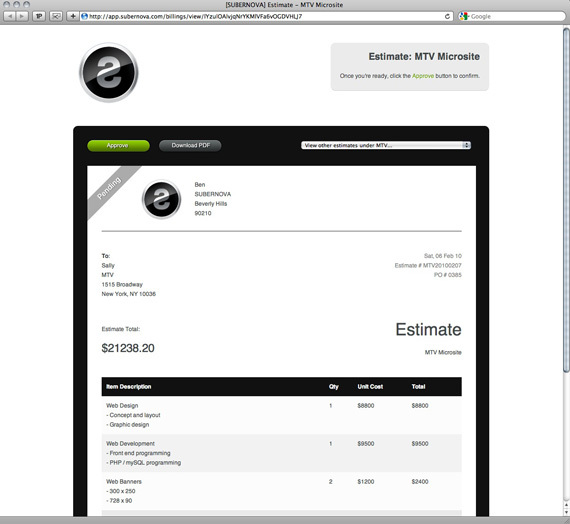 The screenshot below shows how an estimate will look like in the browser. For estimates, your client can approve it by clicking the green “Approve” button. An email receipt will be sent to both you and your client confirming the estimate. If you have a Prowl API registered in SUBERNOVA, you’ll also get a push notification. 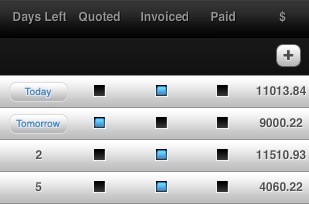 What’s more, your client can also view pass estimates or invoices from a dropdown menu. SUBERNOVA will automatically send email reminders to your clients to inform them that payment is late. This is done every 30, 60 and 90 days from the issue date of your invoice. Once you mark the project as “Paid”, no more reminders will be sent. Reminders will be halt too if you set the project back to “Quoted”. Also worth noting is that email reminders uses your custom message and email signature in your Settings. So please remember to set them! The settings panel has undergone some re-design. You can find your new invoicing settings here. First up, upload your logo! Your logo will appear on the PDF and the online viewing page. If you don’t want your proposals to be named “Quote”, name it “Estimate” or anything else. The same goes for invoices. The “Invoice Reminder Message” will be used for the existing automatic late invoice reminder feature. Your client will be reminded every 30, 60 and 90 days of unpaid invoice with this message. Quotes “Terms & Conditions” and “Invoice Note” are templates where you can edit later when creating or editing a quote or invoice. This is a pretty rare feature among other popular online invoicing tools. When you send an invoice or estimate from SUBERNOVA, instead of using SUBERNOVA’s domain name for these links, you can use your own. This can be done by setting a custom domain name in your Settings. For example, our domain name is hex.sg. I created a CNAME record in my zone file on my hosting server’s control panel naming it “admin”. I point this CNAME to “subernova.com”. Back in my Settings, I enter admin.hex.sg without “http://” or trailing slashes and save. Once you set up your own custom domain name, try accessing it. If it was successful, all your invoices and estimates will be using this domain name. You can even use this address to log in to your SUBERNOVA account! To sum things up, SUBERNOVA has grown into a full fledged online project management tool to keep you more organized, collaborate and manage your staff and co workers, track your time, notify you of due projects and milestones, schedule emails to your clients, available on the web, desktop and iPhone. Now you can even create invoices and quotes. You can find these features elsewhere, but not usually in one application. As a result, your processes are not streamlined, having to manage different applications that looks and works differently. Not mentioning the high combined cost of all the subscription fees. The worst thing is that even if you’re a paying customer, you get to only manage a limited amount of projects, limited amount of invoices etc. In SUBERNOVA, you get unlimited everything and everything in one. We will be increasing the subscription fee to only $14.99/month or $149.99/year (save $30 or 2 months free!). Still a low fee if compared to existing web apps in the market that only offers a little of this and that. SUBERNOVA customers: As promised, you will get to keep the original pricing. Current trial account users: Upgrade with the original price before your account expires. Expired accounts: Revived for the next 10 days! Upgrade before the extension finishes to lock in the original price. *All uses who upgraded with the original price will lock in this price for as long as you stay with us! Thanks to everyone for sticking with us, we hope you had a good start to the new year and the following years to come! This is a GREAT tools that i have been looking for! I have tried many invoicing apps like Invoicera, billingboss, getharvest etc, but SUBERNOVA is really what i want. Are you able to get invoice reports for a year or month etc to give to an accountant for example? Would it be possible to output an xls file? i can’t get the totals to appear on either my quotes or invoices even though the number have been entered next to the item descriptions..
Mario: We’re working on exporting of data. sarah: We’ve resolved this through email. For the sake of other users who may be looking at this, be sure to enter only numeric figures and not alpha-numberic figures. Hey guys, is there any way to set up sequential invoice numbers? Part of the reason I looked into project management/invoicing software was so I didn’t have to keep track of invoice numbers. @Matthew SUBERNOVA keeps track of the last invoice number so you know what to key in for your next invoice. Similarly for quotes.